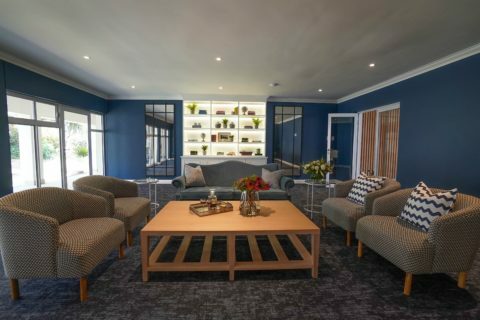 We recently renovated and relaunched San Sereno Retirement Village Sandton. Now, being the gem in the crown of the Auria Senior Living Community, it is where our philosophy, mission and unique approach to senior living come to life. San Sereno Retirement Village Sandton is situated in the leafy-green suburb of Mill Hill, in Bryanston, northern Johannesburg. With numerous amenities close by, including Nicolway Shopping Centre, Montecasino and Sandton City, residents have plenty of choice when it comes to entertainment and restaurants. San Sereno is also near Sandton Mediclinic. San Sereno offers a range of living environments and levels of care for the over 70s. The stylishly-designed Auria Senior Living Communities offer variable combinations of these options. These include apartments and free-standing houses, which are both supported by excellent hospitality services. These services include housekeeping, concierge services and restaurant-style fine dining. Residents can also look forward to a comprehensive programme of cultural, social and intellectual events and activities, as well as a modern fitness and wellness centre. Residents who require assistance with daily-living activities, highly trained care-givers and support staff are at hand. The team provides dignified and discreet assistance, including bathing and dressing, medication reminders, help getting to and from meals and events, as well as any other health or care requirements, as and when they are needed. There are stimulating and fun activities every day at San Sereno. Meals are scrumptiously prepared and the residents’ day-to-day needs are meticulously taken care of by our friendly staff, which includes a concierge and community manager. 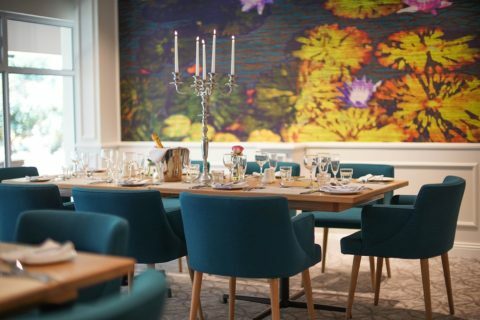 The popular coffee shop, “Café Auria”, is the ideal meeting place for residents, where they can savour a barista-style cappuccino with a slice of delicious cake, or eat a light meal with a cool beverage as they socialise with friends and family. The restaurant serves three meals per day, which are prepared by a professional chef for the residents. Bridge: San Sereno caters for both novices and experienced players. Bowls: residents can join the San Sereno league team. Cinema: residents enjoy regular “Movie Afternoons” in the comfortable movie venue. We also show intellectually-stimulating documentaries which are very popular. The heated in-door swimming pool keeps residents moving all year-around. They can also attend aqua aerobics classes and biokinetic sessions. Well-equipped modern gym: residents can attend exercise classes, which include dance classes, Pilates and yoga. A physiotherapist is available three times per week. There are numerous ongoing community and social events, including guest speakers, themed dinner evenings, and others. Pets are welcome at San Sereno. Residents enjoy walking their dogs along the well-cared for walking paths and manicured lawns. We strive to make our residents’ lives as easy and hassle-free as possible through our comprehensive bouquet of services, which include 24-hour home maintenance services, laundry services, domestic cleaning services, concierge services, driver services, and a San Sereno golf-cart shuttle service. At San Sereno Retirement Village Sandton, we endeavour to ensure our residents enjoy their best quality of life – every single day. Call us today. 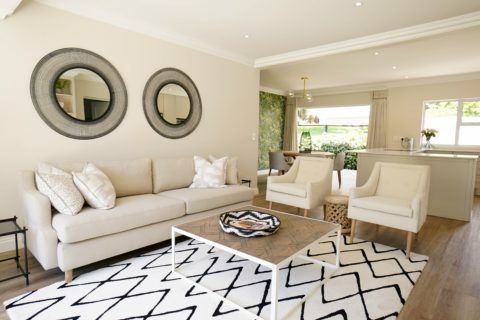 string(21) "Mill Hill - Bryanston"
string(37) "San Sereno Retirement Village Sandton"
string(3707) "San Sereno Retirement Village Sandton by Auria Senior Living We recently renovated and relaunched San Sereno Retirement Village Sandton. Now, being the gem in the crown of the Auria Senior Living Community, it is where our philosophy, mission and unique approach to senior living come to life. 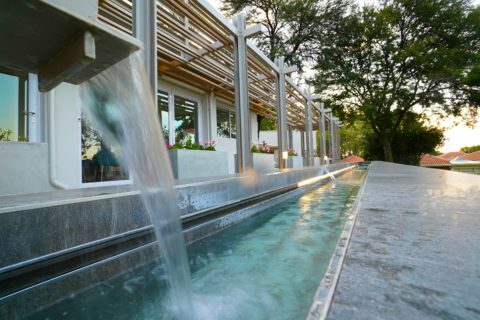 San Sereno Retirement Village Sandton is situated in the leafy-green suburb of Mill Hill, in Bryanston, northern Johannesburg. With numerous amenities close by, including Nicolway Shopping Centre, Montecasino and Sandton City, residents have plenty of choice when it comes to entertainment and restaurants. San Sereno is also near Sandton Mediclinic. Auria Senior Living Community offers Independent Residential, Assisted Living and Care options San Sereno offers a range of living environments and levels of care for the over 70s. The stylishly-designed Auria Senior Living Communities offer variable combinations of these options. These include apartments and free-standing houses, which are both supported by excellent hospitality services. These services include housekeeping, concierge services and restaurant-style fine dining. Residents can also look forward to a comprehensive programme of cultural, social and intellectual events and activities, as well as a modern fitness and wellness centre. Residents who require assistance with daily-living activities, highly trained care-givers and support staff are at hand. The team provides dignified and discreet assistance, including bathing and dressing, medication reminders, help getting to and from meals and events, as well as any other health or care requirements, as and when they are needed. Amenities residents can enjoy at San Sereno Retirement Village Sandton There are stimulating and fun activities every day at San Sereno. Meals are scrumptiously prepared and the residents’ day-to-day needs are meticulously taken care of by our friendly staff, which includes a concierge and community manager. 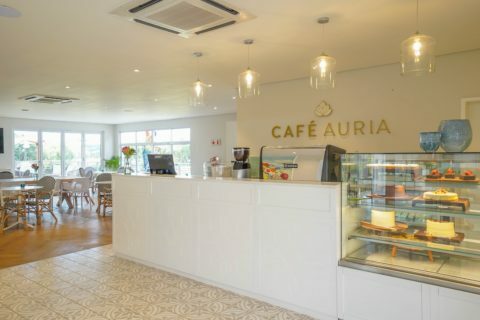 The popular coffee shop, “Café Auria”, is the ideal meeting place for residents, where they can savour a barista-style cappuccino with a slice of delicious cake, or eat a light meal with a cool beverage as they socialise with friends and family. The restaurant serves three meals per day, which are prepared by a professional chef for the residents. There are activities for everybody: Bridge: San Sereno caters for both novices and experienced players. Bowls: residents can join the San Sereno league team. Cinema: residents enjoy regular “Movie Afternoons” in the comfortable movie venue. We also show intellectually-stimulating documentaries which are very popular. 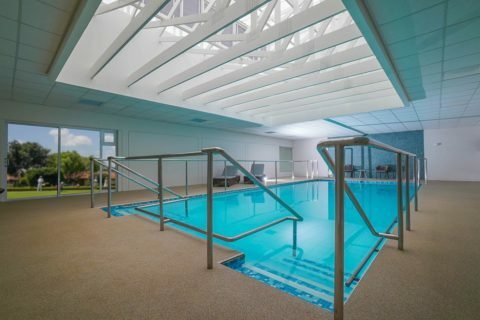 The heated in-door swimming pool keeps residents moving all year-around. They can also attend aqua aerobics classes and biokinetic sessions. Well-equipped modern gym: residents can attend exercise classes, which include dance classes, Pilates and yoga. A physiotherapist is available three times per week. There are numerous ongoing community and social events, including guest speakers, themed dinner evenings, and others. Pets are welcome at San Sereno. Residents enjoy walking their dogs along the well-cared for walking paths and manicured lawns. A comprehensive bouquet of services We strive to make our residents’ lives as easy and hassle-free as possible through our comprehensive bouquet of services, which include 24-hour home maintenance services, laundry services, domestic cleaning services, concierge services, driver services, and a San Sereno golf-cart shuttle service. At San Sereno Retirement Village Sandton, we endeavour to ensure our residents enjoy their best quality of life – every single day. Call us today." string(153) "San Sereno, the retirement village Sandton/Bryanston can boast about was established in 1990. It's owned by a subsidiary of Sanlam Life - Anson Holdings."